Architecture is a very tangible example of creativity. You can see it with your eyes, touch its exterior, feel its fabric and walk its hallways. Music however is much more visceral art form. The notes and harmonies paint vivid pictures in your mind rather than in front of you. These landscapes are unique to you because music by its very nature is subjective. Imagine then, if you could hear architecture. The way a structure is perceived would immediately change and the landscape you perceive would be a perfect combination of the visceral and the tangible. This has been achieved with a restoration project in Croatia. 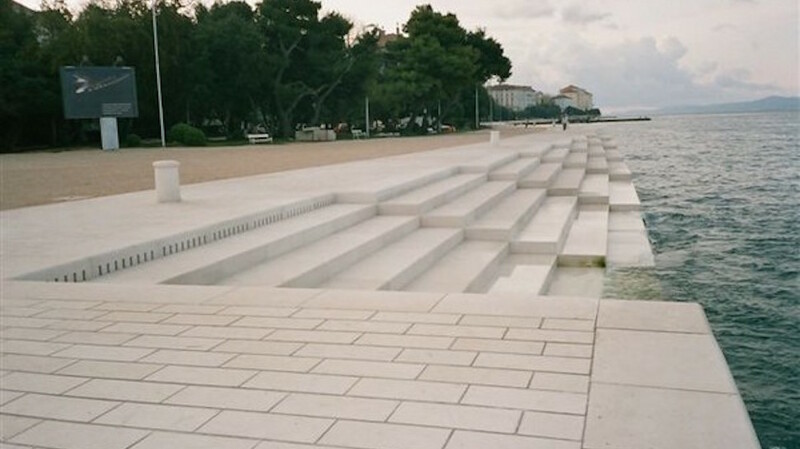 Following utter devastation to Zadar in Croatia during WWII, hasty reconstruction work was carried out soon after in an earnest attempt to rebuild the area. The result (as so often following WWII around the world) was a bland and uninspiring expanse of concrete. In this case, an unbroken, monotonous concrete wall along the seafront. Architect Nikola Bašić decided to try something different and breathe life into the area as part of a project to redesign the new city coast, Nova Riva. On 15th April 2005 he opened a wind and wave powered organ to the public – the first of its kind. As waves break against the altered shoreline, the organ creates somewhat random but harmonic sounds. As wind and waves pass through the organ, notes are sounded at random. Pipes within the organ have been carefully tuned so as to only produce notes that harmonise well together, meaning that despite the unpredictability and spontaneous nature of this instrument/structure, the overall sound is always pleasing on the ear. The sculpture is 230 feet long and comprises 35 organ pipes embedded within the concrete, which sound different notes as you walk along the promenade. The pipes are an intricate system of polyethylene tubes and resonating cavities which turn the site into a large musical instrument, played by the wind and the sea. The Sea Organ (known locally as Morske Orgulje) has become somewhat of a tourist attraction, as well as drawing regulars from the surrounding areas to enjoy its song. Since its original opening, white marble steps leading down to the water have now been added, giving people somewhere to sit and gather their thoughts. In 2006, the Sea Organ was awarded with the prize ex-aequo of the fourth edition of the European Prize for Urban Public Space. Whilst this is obviously a very special and unique concept, it perhaps raises the interesting idea that architecture can actually be multi-functional and appease more senses than just sight. We all live, work and play within the built environment. Wouldn’t it be interesting if as well as us interacting with our surroundings, our surroundings could also interact with us?